On March 7, 1867 an advertisement appeared in The New York Herald offering for sale the newly completed 24-foot wide house at the northeast corner of Lexington Avenue and 36th Street. The asking price would equal about $790,000 today. And by now the Murray Hill neighborhood had nearly fully developed with impressive homes and mansions. The architect of this one borrowed from at least two styles. The triangular pediments above the parlor floor openings drew from Italian Renaissance designs; and the two-story angled bay on 36th Street was influenced by the French Second Empire movement. A family, seemingly named Patten, had moved in within the month, but things did not work out well between them and their cook. On April 3 she advertised in The New York Herald for a new position: "Wanted--Situation as First Class Cook by a German Protestant girl." By the early 1870's No. 273 was home to the Erastus R. Finch family, whose summer home was in North Salem, New York. The family took in a roomer, as was common at the time even among moneyed homeowners. Their female renter apparently held a job, for when she looked for new accommodations in May 1873 her ad read "Wanted--By a lady, who is absent during the day, an unfurnished Room in a private family." Finch headed home from the West Side on evening in January 1874. His decision to walk through the notorious and dangerous Hell's Kitchen neighborhood proved foolish. A gang of toughs attacked him from behind. According to The New York Herald, the "three young ruffians...knocked down Mr. E. R. Finch, No. 273 Lexington avenue, at the corner of Thirty-fourth street and Tenth avenue." The article noted "Mr. Finch is a gentleman of sixty years of age, and while going to his residence was suddenly struck on the head from behind, knocked senseless to the pavement and stabbed five times, one of the stabs penetrating his lungs." His cried of "Murder!" attracted a beat cop named Crow who managed to arrest one of the boys, 19-year-old William Adams. Adams was a member of the Crystal Waves gang, described by The New York Herald as "an organization of juvenile roughs." His trial was held on February 3 and his attorney, William F. Howe, struggled to come up with a defense. He "undertook in the first place to move an alibi, but this proved too thin, and he then undertook to make it out a case of mistaken identity, which defence [sic] proved still more attenuated." Howe called character witnesses to the stand, who "gave him a good character," but police records revealed him as "a hardened young wretch," according to the newspaper. Howe's only hope was to plead for mercy, which the boy got. Instead of a possible 20 years imprisonment, Adams was sentenced to just eight. The Finches were followed in the house by architect William E. Waring and his wife, Frederica. Waring died in October 1882, leaving his widow with a massive estate valued at nearly $12.5 million by today's standards. It appears that even while her husband was still alive Frederica had been carrying on an intimate affair with his married cousin, William H. Harrison. Shortly after the funeral he moved into the Lexington Avenue mansion. Frederica may have thought she could appease Harrison's wife, Sarah, by giving her a house in Brooklyn. It did not work. Sarah, it turned out, would rather have her husband back. Scurrilous details of the scandalous romance were spread in the newspapers after Sarah B. Harrison appeared at Fredericka's door in 1884 demanding her husband back. The New York Times reported "She was shown into the parlor, the magnificence of which she subsequently confessed herself unable to describe." After Sarah waited for about half an hour, William appeared asking what she wanted. "He was at once reproached for leaving his wife and family," said The Times, "and in return he swore like the traditional pirate. It was not a friendly meeting. For several minutes the early morning air was racked and burdened with conflicting sounds, and the louder Harrison swore the more bitter became Mrs. Harrison's wails and lamentations." And then Frederica descended the stairs. "She also added to the volume of sound." Frederica demanded that Sarah "Get right out of this house!" and threatened that if she did not go back to Brooklyn, she would evict her. "Take back your house and give me back my husband and I'll be satisfied," cried Sarah. Sarah, of course, did go back to Brooklyn, defeated and alone. She not only filed for divorce, but sued Frederica for $50,000 in damages--a significant $1.3 million today. The New York Times printed every juicy detail of her complaint. The newspaper noted "Mr. Harrison has been married 36 years. Mrs. Waring is about 40 years old, but is said to look much younger." It included what it described as an "interesting conversation" between Frederica and William's son, an attorney who had been handling her estate. "You must either let my father go home to my mother and take care of her and his family, or I will resign and go home myself," he told her. "Very well. I'll take your father and let you go!" she answered, according to the newspaper. "Young Harrison went home." Although Sarah's complaint charged the pair with "living together in an unlawful manner," they denied the charges. Frederica Warren died in the house in 1891. Around 1895 it was purchased by William Church Osborn, who had been leasing the house directly across the avenue, No. 135 East 36th Street, from J. P. Morgan, his brother-in-law. In October 1894 Osborn hired the well-known architect Charles C. Haight to make unspecified "alterations" to the house. It was most likely at this time that the Queen Anne-style hip roof with its distinctive dormers and chimneys were added. Osborn's wife was the former Alice Clinton Hoadley Dodge. Alice was the daughter of William E. Dodge, Jr., whose father was a partner in the Phelps Dodge Corporation, among the largest copper mining concerns in the nation. Born in 1862, Osborn was he son of railroad tycoon and philanthropist William Henry Osborn. William Church Osborn was given his middle name to honor his father's close friend artist Frederic Edwin Church. Two of Church's masterpieces, The Andes of Ecuador and The Aegean Sea were owned by William H. Osborn. The younger Osborn was a "gentleman," a term used by wealthy citizens who did not need nor care to have a profession. He focused instead on philanthropy and civic roles. He served as the presidents of the Metropolitan Museum of Art, of the Children's Aid Society, and of the New York Society for the Relief of Ruptured and Orphaned. He and Alice had two children, Aileen (who would marry Vanderbilt Webb, great-grandson of Cornelius Vanderbilt, in 1912), and Frederick, who would make his mark in the area of eugenics. 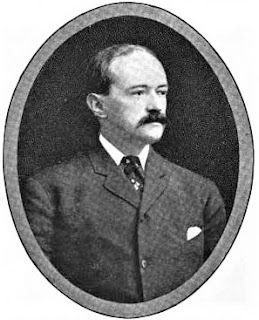 F. Norton Goddard was immensely wealthy. He and Warren had shared equally in their father's estate of more than $340 million in today's money. Shocking to mainstream society, however, not long afterward he had given up his mansion to live in a tenement building, with only "an old and trusted servant." He had explained that he wanted “to escape a life that had become irksome” and to better know and understand the working man. But now married, he necessarily gave up tenement living and moved his bride into the lavish Lexington Avenue home. And like their predecessors in the house, the Goddards were socially prominent. An announcement in The New York Times on December 21, 1898, for instance, noted "The reception which was to have been given this afternoon by Mrs. F. Norton Goddard...at her residence, 273 Lexington Avenue, has been abandoned, owing to the illness of Mr. Goddard." The same year that the couple moved into No. 273 Goddard erected the lavish Beaux-Arts style Civic Club on East 34th Street. The group lobbied for improved tenement sanitation, better plumbing, repairs of dangerous sidewalks, the elimination of policy swindles (a numbers-type gambling racket that preyed on the poor) and other issues. On March 7, 1899, as president of the Civic Club, he testified at the trial of Police Captain Martens who was charged with failing "to suppress policy shops." Norton testified that a month earlier Martens's policemen had warned the keepers of such establishments of pending raids. The Nortons' summer estate was "Fernwood" in Litchfield Connecticut. But they apparently spent the summer of 1901 in Europe. Wealthy families took their staffs with them to their summer homes, and their most indispensable servants--like valets or ladies' maids--along on steamers to Paris or London. A "waitress," or the maid who served meals and tea at dinner or receptions, would not be needed abroad. On May 29, 1901 Alice's ad in the New-York Tribune read "Lady closing her house wishes to place her waitress; one whom she can recommend; can be seen from 11 to 3; none but first class call." When the Goddards returned that autumn, Charles Osborn sold them the house. The following spring they commissioned architect George E. Wood to make significant updates. They included "plumbing, electric lighting, carpentering, plastering, painting work, etc." Goddard's determination to rid the city of gambling dens resulted in his being honored at a massive dinner on June 4, 1903. The New-York Tribune reported "About two hundred of the friends of Captain F. Norton Goddard and the Anti-Police Society gave a dinner last night at the Hotel Savoy." High-ranking city officials were there and President Theodore Roosevelt sent his regrets. By now he and Alice had four daughters, Sylvia, Celestine, Theodora and Annie. The family went to Fernwood especially early in 1905 because F. Norton was feeling the effects of overwork. They arrived the first week of May. The New York Times said that he hoped "that his health would be improved in the air of the hill country." But on the night of May 28 he was sudden stricken with a brain hemorrhage. He died at 9:30 the following morning. Newspapers ran extensive articles about his notable reform efforts, which The Times called a "remarkable career." The Outlook said "His idealism was not academic, theoretical, impracticable; it was practical, effective, genuine. It dominated his life, and determined such commonplace matters as where he should sleep and whom he should make his friends, and it brought him to his death." He was only 44-years old. 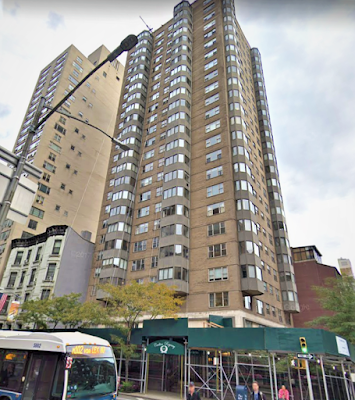 Alice and the girls remained in the Lexington Avenue residence. The following year it was the scene of a terrifying incident, resulting in the New-York Tribune's headline "Mrs. F. Norton Goddard A Heroine." Alice had put Celestine down for a nap on December 20, 1906. Somehow, just before noon, a fire started in the room, most likely from the fireplace. The Tribune reported "On learning that the fire was in the room in which her daughter was asleep, Mrs. Goddard rushed up the stairs and burst open the doors. With much difficulty she placed a blanket about the child and carried her from the burning room." Thomas Slicer was passing along Lexington Avenue and noticed the smoke coming from the windows. He rushed into the house and helped the servants in putting out the fire. The newspaper added "He also tried to quiet Mrs. Goddard, who had become hysterical after the trouble was all over." 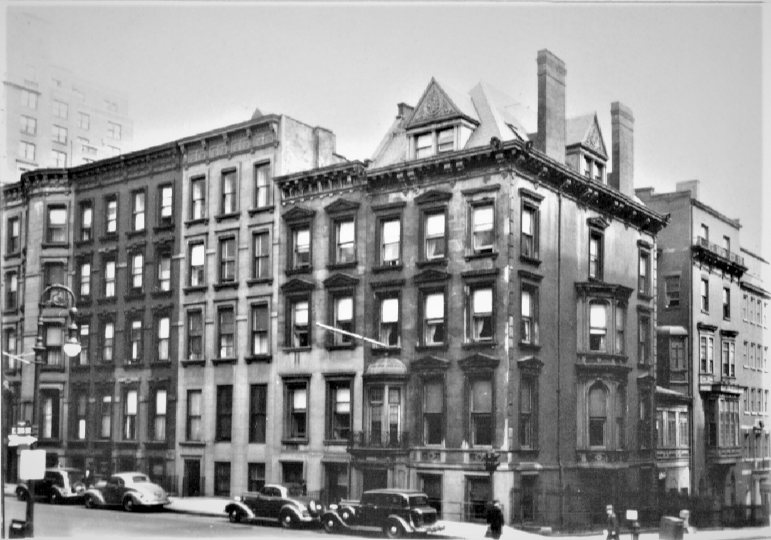 Alice remained on Lexington Avenue for years, working closely with charities like the Warren Goddard House, a settlement house originally called the Friendly Aid Society. It had been renamed in honor of her brother-in-law in 1901. On March 26, 1918 The Sun reported that "There was a meeting of the sewing class for the benefit of the Alguille Francaise Vestiare National yesterday morning at the home of Mrs. F. Norton Goddard, 273 Lexington avenue." Alice's two eldest daughters had become young ladies in 1921 and they shared their comings out. On November 13 The New York Herald wrote "Debutantes were in evidence last night at the small dance given by Mrs. F. Norton Goddard of 273 Lexington avenue in the ball room of the Colony Club for her two daughters, Misses Celestine and Sylvia Goddard, who were formally introduced to some of their young friends." The article added "Miss Celestine Goddard is a student at Bryn Mawr." The following year Alice Winthrop Goddard died in the Lexington Avenue house after a short illness. None of her daughters were yet married. Alice was now attending Bryn Mawr and Theodora was at the Walker School in Simsbury, Connecticut. By now Lexington Avenue was not been the quiet residential street it had been in the 19th century. The Goddard sisters sold the house to the Amherst Club of New York, an association of alumni of Amherst College. The Amherst Graduates' Quarterly announced that same year that $97,000 in alterations were being made (just under $1.5 million today). The article said "The clubhouse will have a special dining room with facilities for class dinners, chapter reunions, and various alumni gatherings, in addition to the large main dining room where meals will be served at cost." A special "ladies' dining room" would serve "women relatives and friends of members, whether or not escorted by members of the club." Upstairs were sleeping quarters for 30 men and the top floor was converted to "a good-sized squash court." The stoop was removed and the entrance lowered to sidewalk level. The former entrance was disguised by a handsome hooded oriel. The clubhouse was formally opened on October 19, 1923. President Calvin Coolidge, a "life member elect," sent a message of congratulations. The opening came just in time to receive an important visitor. Viscount Holmesdale (otherwise known as Jeffrey John Archer Amherst) arrived in New York from England that week. The 27-year old had last been to the United States to attend the centennial of the founding of Amherst College, named after his great-granduncle, Lord Jeffrey Amherst. On October 30 Viscount Holmesdale was awarded an honorary membership to the club. In 1929 the Amherst Club purchased the former Colonel Henry L Stimson house next door at No. 275. After renovations, the club offered the second floor of the Goddard house as the club rooms of the Psi Upsilon Club of New York. The Diamond of Psi Upsilon explained "Included in the arrangement is the use by our members of the various dining rooms, including the ladies' dining room, grill room, and bed rooms, of the Amherst Club at the same rates as the Amherst men pay." 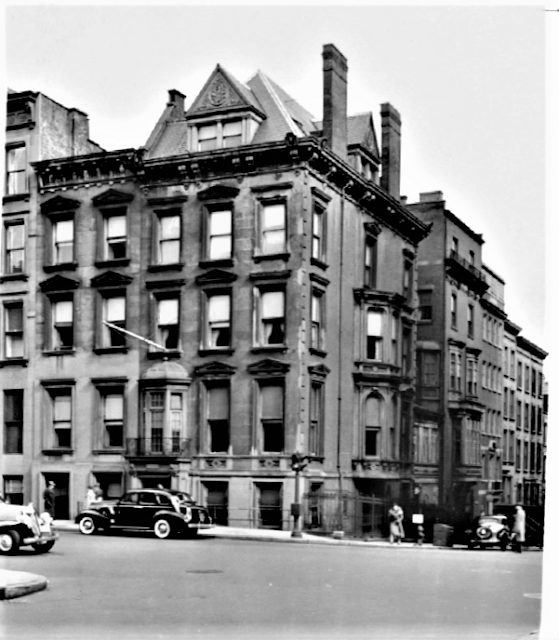 The clubs remained in the former mansions until 1939 when the Association to Promote Proper Housing for Girls, Inc. took it over. That was a short-lived venture and in 1941 No. 273 was converted to 18 furnished rooms and three apartments above the basement level, which held two apartments and two furnished rooms. The building was now called The Amherst as a nod to its former owners. Among the residents of The Amherst was renowned puppeteer Paul McPharlin who moved in around 1944. His biographer, Ryan Howard, described it in his Paul McPharlin and the Puppet Theater. "He had a large and pleasant corner room, with a bay window on one side and a kind of oriel on the other, providing good cross-ventilation." In addition to the rooster design wallpaper, "The landlady had the room repainted for him, in white and powder-blue." Another notable resident was African explorer and cartographer John P. McDermott. The New York Times said he "had long been associated with the African Colonial Office at 512 Fifth Avenue, where he was prepared to arrange safaris and to warn visitors to Africa on the dangers of the tsetse fly, a subject on which he was an expert." McDermott died in his sleep in his room here on February 8, 1949. The old houses of Lexington Avenue fell one by one throughout the rest of the 20th century, or were altered beyond recognition. 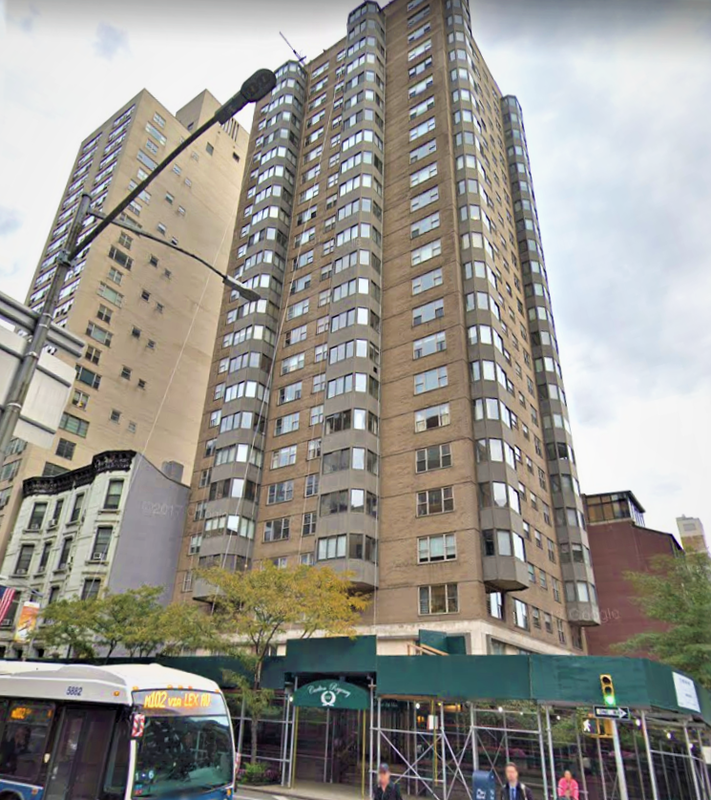 Finally, on October 14, 1965 The Times reported that "Construction has started on a 24-story office and apartment building on the northeast corner of Lexington Avenue and 36th Street." The Carlton Regency, designed by Stephen A. Lyras, was completed the following year.